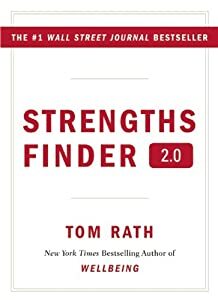 A few months ago, I had the privilege of reading StrengthsFinder 2.0 by Tom Rath for my paythebills job. The book is based on the premise that when people are aware of their strengths, and the strengths of those around them, they can begin to live a balanced and fulfilled life. The book itself is set up with a short introduction of how the researchers developed the StrengthsFinder assessment tool, followed by a detailed description of the 34 talent themes in which those strengths are expressed. The part of the book that matters? The access code sealed in the back of the book that allows you to take the assessment online. Whatever you collect, you collect it because it interests you. And yours is the kind of mind that finds so many things interesting. The world is exciting precisely because of its infinite variety and complexity. If you read a great deal, it is not necessarily to refine your theories but, rather, to add more information to your archives…So you keep acquiring and compiling and filing stuff away. It’s interesting. It keeps your mind fresh. And perhaps one day it will prove valuable. Anyway, I was thinking more about my strengths this week. I was floundering a bit, trying to find direction or headway in my WIP, and may have been procrastinating by rereading passages of Bird by Bird and On Writing. Then, I noticed StrengthsFinder on my desk, and decided to give that a reread as well. When I got to my Achiever theme, I started to wake up a little. You have an internal fire burning inside you…Your relentless need for achievement might not be logical. It might not even be focused. But it will always be with you. As an Achiever you must learn to live with this whisper of discontent. It does have its benefits. It brings you the energy you need to work long hours without burning out. It is the jolt you can always count on to get you started on new tasks, new challenges…It is the theme that keeps you moving. I asked myself on Wednesday why I write. Why do I bother working on a story that feels too big for me. I answered with the blogpost, “Why I Write.” I appreciated my friends reminding me of the reasons why I want to tell The Story. Because, yes, I believe those reasons, and they are true for me. But, honestly…I think why I pursue writing is a lot simpler for me. I write because I can, and because I chose that as a goal. I write because it became The Skill that I want to master. I always return to The Story simply because I need to finish it. This is who I am. I am that sick fool that looks for challenges and seeks the uncomfortable. I recognize that these challenges, and the overcoming of them, gives me a sense of purpose and satisfaction with my life. This fire that gives me the discontent to keep pursuing my goals is the reason itself for me to write. I AM WRITING THIS STORY BECAUSE I AM THE ONLY ONE WHO CAN. *For the curious, my top themes are Input, Learner, Intellection, Achiever, Ideation. Thank you! It’s always easier to create (and adhere to!) an action plan when I know my strengths! Keep on writing! As your fellow nerd, I totally ate this post up. 🙂 Thanks for sharing! !